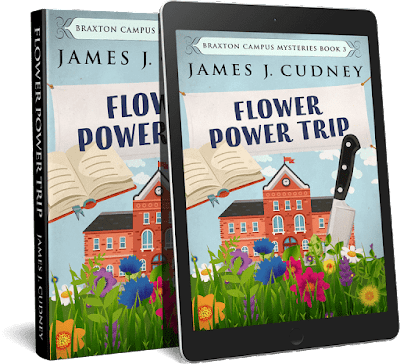 Flower Power Trip is the third book in the Braxton Campus Mysteries by James J. Cudney. Also available: Academic Curveball and Broken Heart Attack. Pre-order now: Mistaken Identity Crisis. 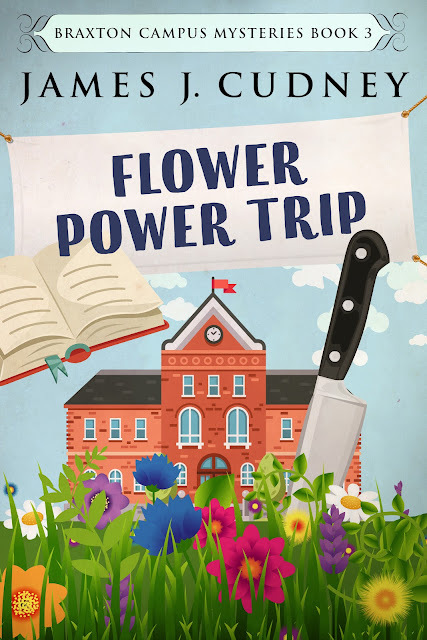 Flower Power Trip is currently on tour with Great Escapes Virtual Book Tours. The tour stops here today for a guest post by the author, an excerpt, and a giveaway. Please be sure to visit the other tour stops as well. A postcard with an image of lush sprawling foliage and a rust-covered antique carriage taunted me from the cushy passenger seat of my SUV. I almost veered off the road twice on the drive to campus because I couldn't peel my eyes away from its persistent glare and blatant reminder of Mendoza. It had to be from Francesca. No one else knew about the remote South American vineyard we'd visited on our honeymoon many years earlier. I shook my clenched fist at the spooky vision of her vanishing in the rearview window. Was she following me everywhere now? It was Francesca's seventh message since leaving town and failing to inform anyone she wasn't returning to Los Angeles. A torturous weekly mystery highlighting her whereabouts but leaving no way to contact her. At first, I thought she'd accepted my decision to remain in Pennsylvania and would wait until her parents, the heads of the Castigliano mob family, discovered a way to bring her back from the dead. Let me clarify—she wasn't truly dead, but everyone thought she was. Upon getting caught in a vicious war with Las Vargas, a rival crime family, Francesca's parents had faked her death as the only way to keep her safe. No one else besides Francesca's parents and my sister knew Francesca was alive. My wife just needed space to adjust to the changes. For two-and-a-half years, she'd been sequestered in a Los Angeles mansion watching from a distance as I raised our seven-year-old daughter on my own. Emma stayed with her nonni a couple of nights a week which made Francesca feel like her daughter was never too far away, but she couldn't actually talk to Emma. Once I moved back home, Francesca lost her ability to see Emma and materialized from seclusion hoping to reconcile. Based on the postcards, she was visiting all the places we'd once traveled to together. Perhaps she needed to feel close to me since I'd refused to participate in whatever game her family was embroiled in with Las Vargas. Unfortunately, now that the Castiglianos blamed me for Francesca's inexplicable disappearance, I anticipated their goons lurking around the corner and following me all the time. Dramatic stuff, huh? I drove along Braxton's main street cutting through the center of our charming, remote town and parked in the South Campus cable car station's lot near Cambridge Lawn, a large open field filled with colorful flowerbeds, bright green blades of thick grass, and moss-covered stone walkways. It was Saturday, which meant graduation day at Braxton College—also my first one as a professor at the renowned institution. Although I'd only been back for a few months, it felt like I'd never left given my mother, Violet Ayrwick, was still its director of admissions and my father, Wesley Ayrwick, had just retired from its presidency. He would co-lead the ceremony with the new president to complete his responsibilities, thus allowing him to concentrate on converting the college into a university. Although I'd been apprehensive in accepting my professorship, I grew excited about the opportunity to reconnect with family and friends whom I'd hardly seen since originally leaving town a decade ago. When my cell phone vibrated, I clicked a steering wheel button to display the text message on the SUV's dashboard screen. The previous owner, a family friend who'd been murdered earlier that year, had added all the bells and whistles making it easy to remain hands-free. Was I the only one slightly unnerved by driving a dead woman's car? Braxton is one of four villages in Wharton County. Wharton County is in north-central Pennsylvania, about ninety miles south of Buffalo, New York. 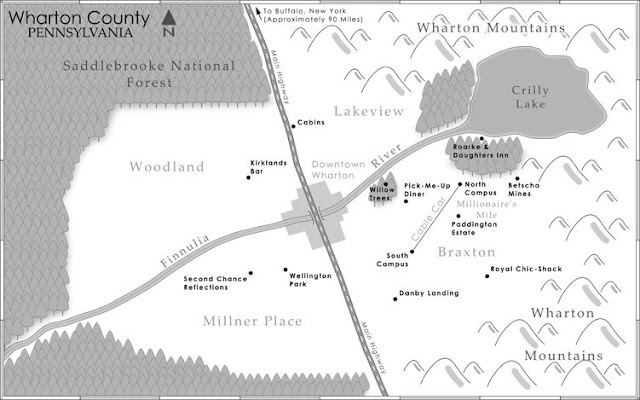 The other three villages include Millner Place, Woodland, and Lakeview. Savvy readers might remember Woodland from my second novel, Father Figure, which takes place on a different college campus. Wharton County is fully surrounded by the Wharton Mountains and the Saddlebrooke National Forest. There is one major highway running from north to south cutting through the center of the county. The Finnulia River empties into Crilly Lake and once served as a transportation system to deliver goods in and out of these communities. Each of the four towns has a college. Braxton College is made up of North Campus and South Campus, and the two are connected by an electric cable car system that transports students and staff back and forth all day long. Along the one-mile path between the two campuses is a thriving shopping district and Millionaire’s Mile, where all the wealthy family homes reside - the Paddingtons, Nutberrys, Stantons, and Greys. Braxton was built by the Danby and Betscha families over three hundred years ago. Seraphina Danby, better known to most as Nana D, is the town’s best connection to its past. At 75, she wants to become the mayor of Wharton County (if she wins the race, you’ll find out in the next book) and transform the aging county into a thriving community once again. The Ayrwick family has been in residence for a long time, too, but Wesley (the patriarch, Kellan’s father) hasn’t told us much about them. We’ll find out in the future what brought them to Braxton, and let me assure you, it’s going to rock the boat! For now, we’re focusing on the wealthy and founding families so we can understand how the county evolved. At the very end of this third book, Flower Power Trip, I will reveal the Flower Power Trip and the plot of the fourth book which will be released in the summer of 2019. I’m gearing up for a major fall release with the fifth book. It will be published shortly before Halloween and will be a holiday-themed ghost story. The plot is by far my favorite so far, and I’m planning to finalize the outline next month. I’m absolutely humbled and grateful to share the world of Braxton and the Ayrwick family with everyone. I hope you find them as hilarious, comforting, and realistic as I do. Sure, this many murders wouldn’t really happen, and sometimes the characters should be put in jail for the way they behave, but this is a fictional place. All I can say is … they live and breathe in my head as if they were real, and that is what motivates me to write their stories every single day. James is my given name, but most folks call me Jay. I live in New York City, grew up on Long Island, and graduated from Moravian College with a degree in English literature. I spent fifteen years building a technology career in the retail, sports, media, and entertainment industries. I enjoyed my job, but a passion for books and stories had been missing for far too long. I’m a voracious reader in my favorite genres (thriller, suspense, contemporary, mystery, and historical fiction), as books transport me to a different world where I can immerse myself in so many fantastic cultures and places. I’m an avid genealogist who hopes to visit all the German, Scottish, Irish, and British villages my ancestors emigrated from in the 18th and 19th centuries. I frequently blog and publish book reviews on everything I read at This Is My Truth Now. Writing has been a part of my life as much as my heart, my mind, and my body. I decided to pursue my passion by dusting off the creativity inside my head and drafting outlines for several novels. I quickly realized I was back in my element growing happier and more excited with life each day. My goal in writing is to connect with readers who want to be part of great stories and who enjoy interacting with authors. To get a strong picture of who I am, check out my author website or my blog. It’s full of humor and eccentricity, sharing connections with everyone I follow - all in the hope of building a network of friends across the world. Enter the tour-wide giveaway for a chance to win a print copy of Flower Power Trip by James J. Cudney (US only). Thank you so much for such an amazing post. It has everything, and it's linked to all the original sites... you are incredibly generous! :) I appreciate the time you put into this. Hope you love the map and explanation of the town. Have a wonderful week. 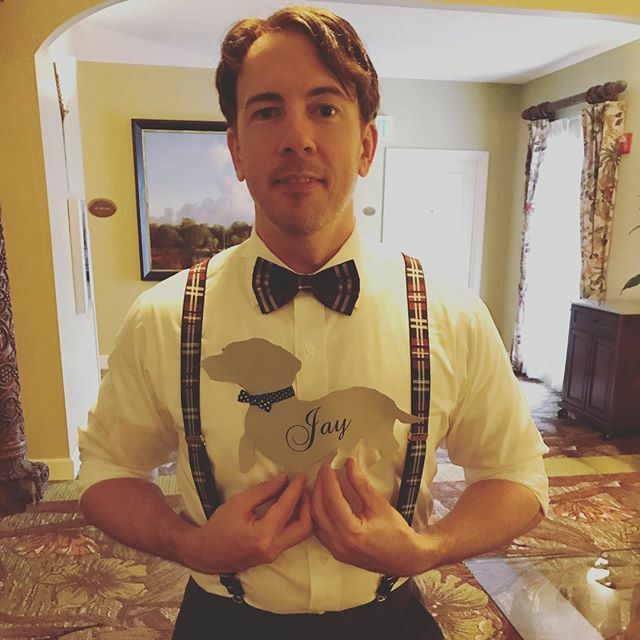 My pleasure, Jay. Thanks so much for stopping by and sharing Wharton County with us. Enjoy the rest of your tour!